Convert FLV to 3GP using FLV to 3GP Converter. Free Download. We always like to download some interesting videos with FLV format on the internet, and then play it on computer, or on our mobile phone to enjoy it everywhere. What video formats do your mobile phone support? MP4, 3GP, or others? 3GP is always used on 3G mobile phones, but some 3G and 4G phones can also support it. So we need to convert FLV to 3GP to enjoy these downloaded videos on mobile phone. How to convert .flv to .3gp? Is there any simple way to complete the conversion from FLV to 3GP format? Xilisoft FLV Converter is a powerful FLV file converter to very easily convert FLV to 3GP file format. 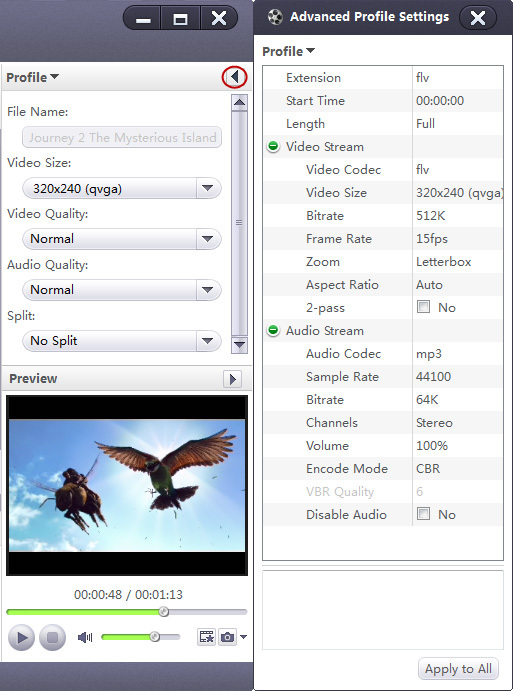 It can also convert FLV to other popular video file formats such as AVI, MPEG, WMV, DivX, MP4, MOV, etc. With it, you can even convert AVI, MPEG, WMV, MP4, 3GP, etc. video to FLV video with very fast speed. Step 1: Free Download the FLV converter and install it. Step 2: Add FLV files. Click "Add File" button on the top of interface to load your FLV files. Choose the file you want to convert, click "Profile" drop-down button to choose "3GPP - 3rd Generation Partnership Project(*.3gp)" as your output format. After choosing a profile, you can adjust parameters by clicking the "Advanced Profile Settings" button. Step 4: Start to convert FLV to 3GP. Click "Convert" button to start the conversion. The conversion can be done with super fast speed. Ok, done. Now you can transfer converted 3GP file to your mobile phone, enjoy interesting videos where ever you are. If you're interested in this FLV to 3GP converter program, free download Xilisoft FLV Converter to get the conversion easily done. How to convert FLV to PSP video files? How to convert FLV videos to Zune video and audio files?